Even if you have been a homeowner for years, you probably do not know everything about your home. This is especially true if you aren’t a DIY person or someone who does a lot of hands-on maintenance. One thing you may have noticed over the last few months has to do with your heating system. If “AUX” appeared on your thermostat, you may be wondering why. This means that the auxiliary heat came on. Let’s explain what this means exactly. First, if you see “AUX” it means you get your heat through a pump. 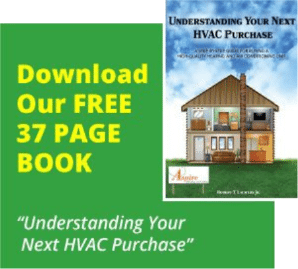 A heat pump works by drawing heat out of the outside air. It then pumps that heat into your home through the vents. Normally, there is enough heat in the air for this process to work, even on cold days. But when the temperature drops too far, the pump needs some help. Auxiliary heat uses a back-up system in order to generate the desired heat. This is a built-in feature that ensures you will always get the necessary warmth you need. The AUX heat will also come on in the event that the coils inside the pump freeze. You know you have a quality heating system if you do not have to worry about it. Once you turn it on, it should provide you with enough heat to keep everyone comfortable. If this is not the case, it is time to seek help. At Aspire Heating & Cooling, we are the heating experts. If you are having any sort of problem with your heat pump, we will send an experienced professional out to your home. They will diagnose the issue and make the necessary fix. For a free quote or to request service, please contact us. We also have maintenance plans, which provide regular checkups for your heating system to avoid costly issues in the future.